Come learn from a real islandgirl for a genuine cultural experience and for a good workout, too! I am originally from Hawai'i and now make my home in Newport News. I am a kumu ("teacher") and ra'atira ("teacher" or "director"). I teach all ages and all levels via my Kinderhula and Polynesian Dance Studio divisions. We are also home to Hula Divas and Noelani's Royal Polynesian Revue which are premier hula lu'au entertainment groups in Virginia, owned and operated by a part Native Hawaiian wahine. 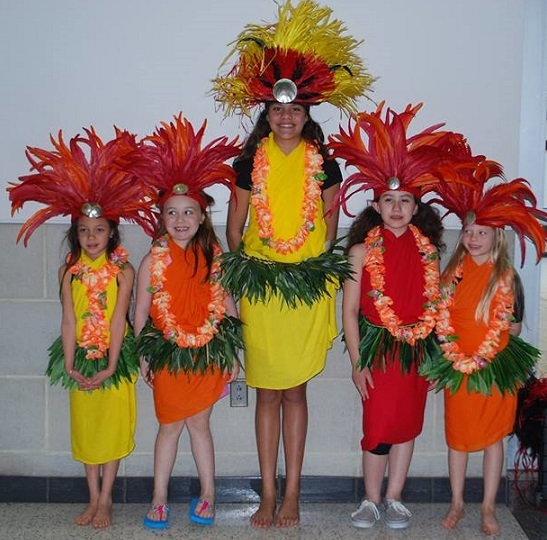 We are always enrolling new students into our halau (hula school) and pupu ori (Tahitian dance group). I am proud to be Virginia's Ambassador of Aloha and honored to perpetuate Polynesian culture through culturally accurate education and hula. We provide opportunities for students of all ages to develop the aloha spirit and help foster Polynesian values and traditions in their daily lives. All experience levels, ethnicities, and ages are welcome. We are proud to be a multicultural hula halau and pupu ori. For Hawaiian hula, I teach both hula kahiko and hula auana, various styles of ori Tahiti (Tahitian dance), Maori, and dances from the Cook, Tokelau, and Tuamotu Islands. No experience necessary. A great way to learn authentic dances of the islands and have fun and exercise, too! I am also available for private classes and choreography consultations. Hula classes are $40 per month per 'ohana (family). $50 costume fee for all new students. Open enrollment for the first week of every month. Schedule is subject to change. Minimum of 2 students or class will be cancelled. Pre-registration is required. Registration is not confirmed until form is completed and submitted and full payment is made. No refunds, but payment may be applied to another class or workshop. We perform at many public events as a way of giving back to our community and sharing the aloha spirit. My haumana (student/s) have an opportunity to become members of our professional hula dance teams as they become more skilled. I also offer authentic hula/ Polynesian dancing and lu'au (pa'ina) entertainment, kids' parties, and other special events involving hula and/or the Polynesian culture. I offer various performance packages or I can customize our entertainment for you. We also offer Hampton Roads' first and only fresh flower lei greetings, hula grams, and lei grams and a variety of entertainment packages, including specialized shows for nursing homes, luaus and parties, and Virginia's own Noelani's Royal Polynesian Revue! Please email me at classes @ ohana arts studio . com (no spaces) for more information. You can also find us on Facebook. I look forward to meeting you!